HoA-REC&N, in collaboration with Ethiopia Wildlife Conservation Authority (EWCA) is piloting a community scouts programme to promote active involvement of local communities to prevent and combat wildlife crime around Gambella National Park in the Boma-Gambella Landscape. Promoting active community participation in wildlife protection in the Horn Region is one of the key components of the Wildlife Crime Prevention Programme that is funded by the Government of the Kingdom of the Netherlands and hosted by HoA-REC&N. 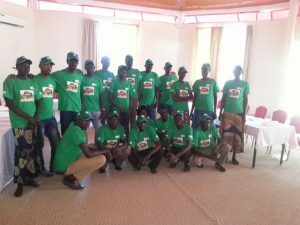 To kick start the pilot program, HoAREC&N, EWCA and Gambella Regional Government selected 18 community members around Gambela National Park to be trained as volunteer community scouts. The scouts will be tasked to collect information on poaching around the park, identify trafficking routes, disrupt poaching and trafficking activities and act as conservation ambassadors by raising awareness on the value of wildlife resources to local economies. 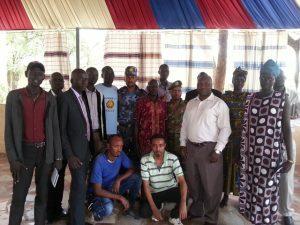 The training was conducted in Gambella from 16th to 25th March 2017 to equip the community scouts with the necessary knowledge and skills to tackle wildlife crime. The trainers were drawn from EWCA, Police and selected experts from other organisations that are actively involved in combating wildlife crime in Ethiopia. The trained community wildlife scouts will be facilitated with field equipment and items, including transport and other tools to help them effectively carry out their responsibilities. Communities adjacent to protected areas play a big role in wildlife protection and conservation since they are the first line of defense for Wild animals. More importantly, they often bare the highest cost of conservation be it in terms of wildlife attacks on people, crops raids or being deprived of land for cultivating to ensure integrity of the ecosystems. Even more, engagement of local communities adjacent to the park in wildlife protection creates a sense of ownership and recognition. This, if implemented alongside other incentives to communities, will go along way to address incidences of wildlife crime around Gambella National Park, which is a habitat to one of the few remaining population of elephants in Ethiopia.